Rainwater collection, also known as rainwater harvesting, is the process of collecting natural rainwater, which can then be used as an alternative to standard mains water use – helping to save money on water charges and helping to conserve fresh water reserves. Traditionally Rainwater Harvesting required major works and the burying of a large tank in the garden. 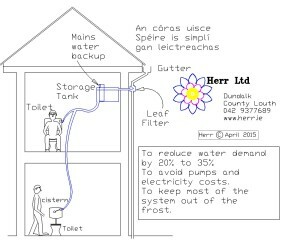 The Herr Rainwater Harvesting system does not require this and is ideal for terraced homes with no outside space. Water charges were introduced into Ireland 2015. With the rainfall we have here, rain water collection from many Irish roofs can replace as much as 40% of the water a normal household would use (depending on the size of the roof and yearly rainfall). Our systems focus on collecting water for use in toilets because toilet water does not need the high treatment standards when compared to the standards required for the kitchen tap; which must be clean enough to drink. As toilets on average use as much as 30 to 35% of the household mains water demand, so this is a relatively easy target to save on water charges in Ireland. For more information on how the system works please see the information below the diagrams. This system reduces water demand by 20 -30%. Rain water is collected on the roof and passes through a leaf collector before begin stored in a tank inside the house in cupboards. “The water is then used for toilets” As an option, a low energy pump can be added so that water is pumped into larger storage tanks in the attic. The only visual change to the outside of your home will be a small rectangular box of about 8” x 8” x 8” located under the gutter at the top of the down pipe. This system is very similar to the Mini Rain Water Collection except that there are additional storage tanks which allow you to store more water in times of heavy rain. Assuming early co-operation with architects, Herr can also provide for systems using rain water that is treated for much wider domestic uses using mini sand filters that do not use electricity. 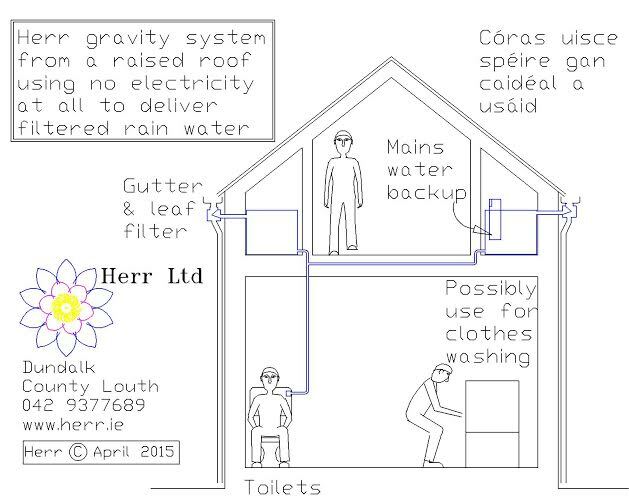 This option would be for home owners who have much greater rain water collection roof and want to use rain water for other purposes. In this case treating rain water to remove a very large proportion of the bacteria and viruses might be justified. Instead of using ultra violet lights, sand filters which don’t require electricity or UV bulb replacement costs will remove the greater majority of harmful bacteria in the water that washes off the roof. Sand filters alone are not guaranteed to meet the very strict legal EU Drinking Water Standards. They are however often recommended on their own by the WHO as an appropriate and reliable way to make water safe for 3rd world applications. Indeed in Ireland along with chlorine and fluorine, sand filters are part of a multiple stage process in providing our mains water supply. 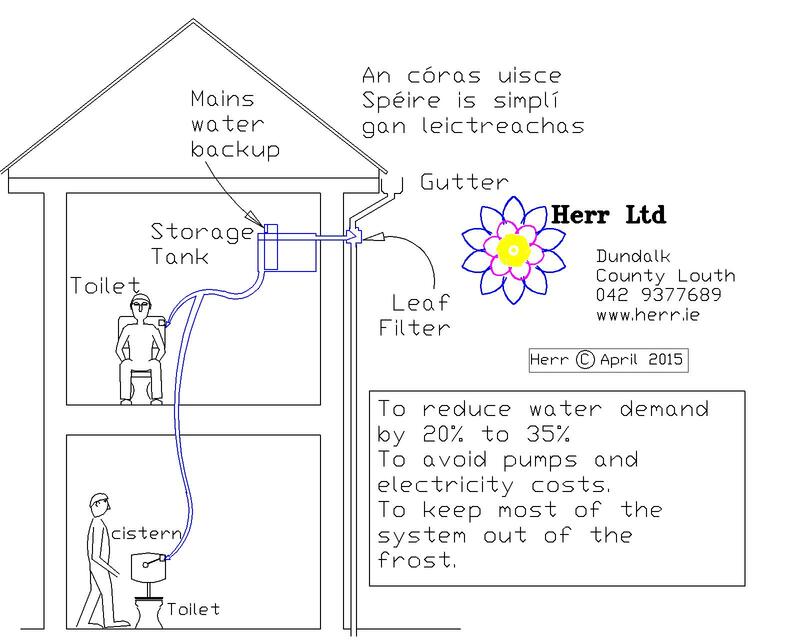 Herr Ltd can provide sand filter systems to treat rain water fit for general domestic water use, excluding drinking, if the roof collection area and the water charges justify the expense. This option does not come with approximate pricing as each house differs in requirements. 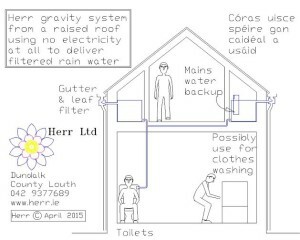 The Herr no-electricity Rainwater harvesting System catches the water under the gutter of the roof. It is taken inside the house and is stored in tanks in cupboards and presses in the same way as we do with tanks in hot presses or header tanks in attics. The water then runs by gravity without pumping down into bathrooms to be used for toilets. Where you can give the high up space inside these cupboard spaces for storage tanks and leaving the lower spaces for clothes and shoes. Where there is no space for tanks outside the house, water storage tanks inside houses in the attic or hidden away neatly on high shelves in cupboards. These cupboards can be in hall ways, dressing rooms, bed rooms, bathrooms etc. with clothes and shoes stored away on the shelves below. The wider the cupboards, the greater the space for storage tanks for the rain water. There are almost no electro / mechanical elements, thereby reducing the number of things that can go wrong or faulty.